Georgie and I are pretty lucky in that we don't have a grey or white horse; I can only imagine the elbow grease needed to keep them clean all the time! We do have a horse with white socks though and he loves to wallow in it. 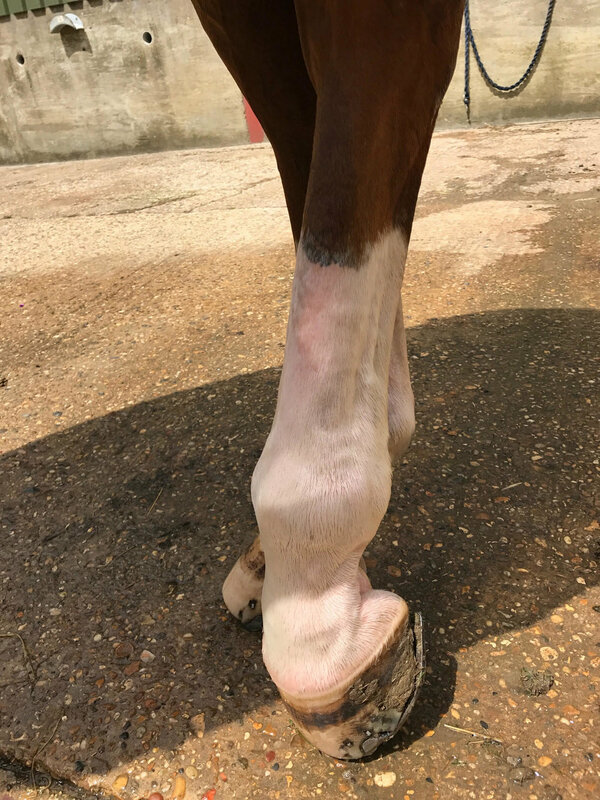 We also have very clay-y ground where we are and it's an absolute nightmare to clean off and stop mud fever, but we have been using this amazing product for well over a year now and it's fabulous. Not only does it clean mud off but also other stains and muck less easy to remove. Such as stable stains, which our friends horse Millie loves to demonstrate. What is it with greys and laying on 'poo pillows' ? Alas they leave these almighty dried on stains but with some warm water and polar white stain remover they come off well. First step is wet the area with a sponge to really allow the stain to lift from the skin. Once left for a minute or two to saturate then spray on a decent amount of spray. Use sparingly as it does go a long way but obviously enough to cover the whole stain. Then, depending on how ingrained that poo stain is either use a sponge or brush to work the polar white into the muck. You should notice that almost instantly it begins to lift away from the skin and come off. A little bit of elbow power later and your stain should have entirely gone! Ta-Dah! Poo stain removed and non the wiser that it had ever been there. We've also found with Beanie is that in the summer time when he lays down to rest he gets these greasy patches on his shins. Our prediction is that they're from his sheath where he's tucking his legs tight into himself when he's laying down and the mix of fly spray and grease is transfiguring onto his legs. It's also really hard to get off and not even normal shampoo and break down these gross greasy stains but we've found that polar white is just the product to get rid of them. Obviously with legs you do have to be careful not to make the area sore so not too much vigorous brushing but just repeat the steps above; wet the area, spray on polar white stain remover, work in with a sponge or softly with a brush and a short while later it will have lifted off. Now don't worry, no we haven't rubbed his shins raw it's that Beanie has very pink skin on his socks and when washed like this shows through very visibly! This is a must have product, not just in the summer in your grooming kit for the show ring, but year round! Now we're coming up to a new show season I am about to buy a huge long supply bottle to keep us going for months! 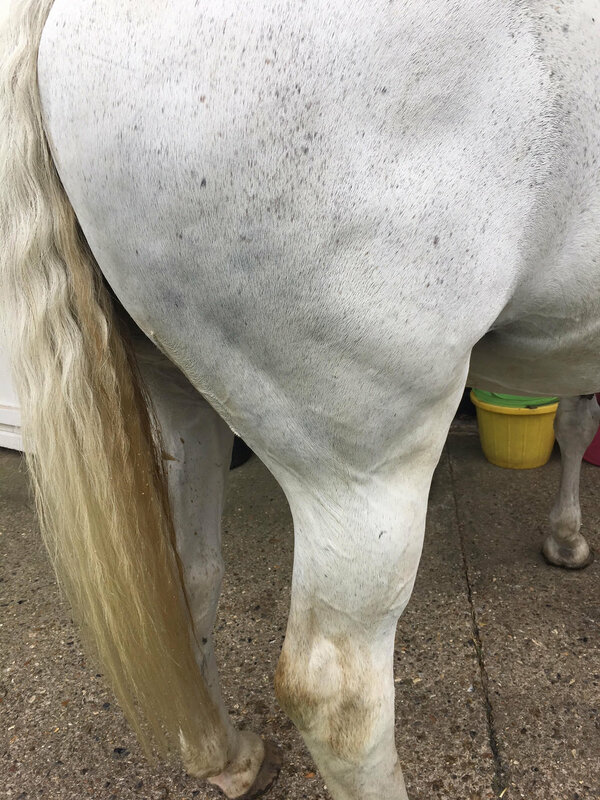 We recommend using it in conjunction with Smart Groomings Leg and Body Whitener as once the area is clean and stain free, it can be made to me super duper white for the show ring and other events. A 500 ml bottle is £9.95 or an extra large supply bottle of 5 litres is £45 and will last for ages!